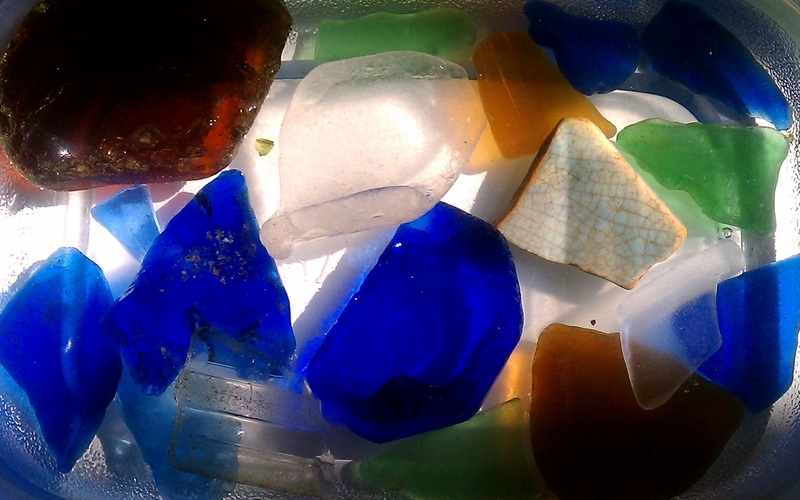 So this morning while walking the dog, I discovered a pile of glass and pottery shards on the beach. 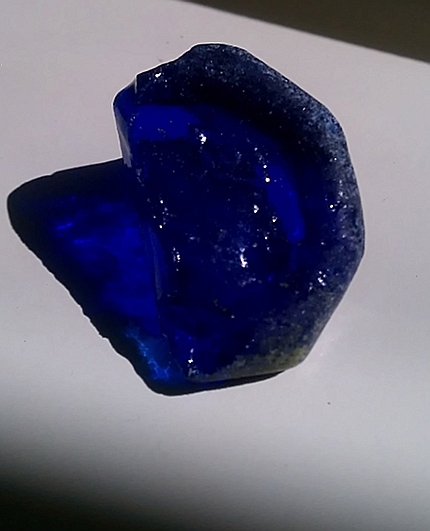 Some of the pieces were very large and unusually thick, so I looked around to see if someone was nearby who might have collected them, but there was no one on that stretch of beach but some surf fishermen, so I took the most interesting pieces and put them into some fresh water when I got home to loosen the salt crust. 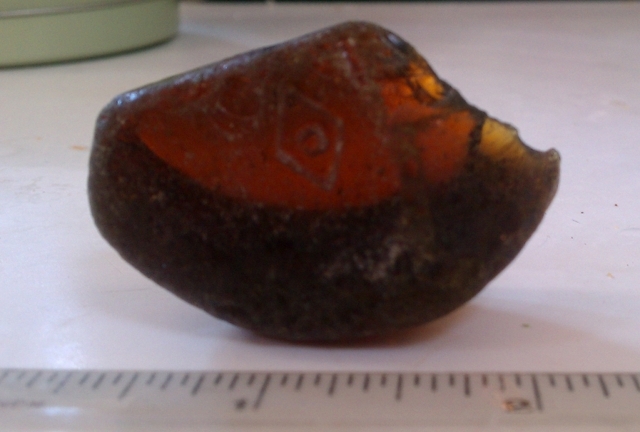 A couple proved to be the bottoms of bottles and their maker marks were intact and still visible. If you squint a bit, you can see that the D-in-a-Diamond logo is pressed into the glass of the brown piece, but is raised on the blue piece. Once I got a look at this, I went online to see what the mark was: the manufacturer’s mark of the Dominion Glass Company of Montreal Canada which started using this logo in 1928 (but I couldn’t discover if the company is still using this mark, today–the company seems to still exist, but info is hard to pin down). Chances are good both these pieces came from some kind of bottle. 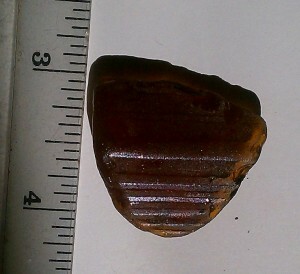 I wish I knew what kind, because both the pieces are unusually thick. Brown seen from bottom--look how thick the sidewall is. 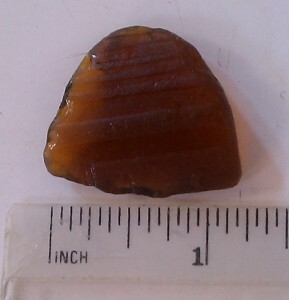 Thick brown glass bottom--almost 1/2" thick! 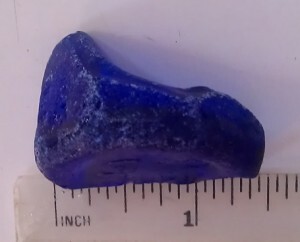 Blue showing sides and thickness of bottom--just over 1/4"
The blue doesn’t seem as impressive as the brown, but it’s still quite thick by bottle standards. What’s funny about the blue piece is that it seems to be half of an 8-sided bottle. If the bottle were round–well an equilateral octagon–it would be just under 1.5″ across, which might make it a medicinal salve container. But not one for Vick’s Vapo-Rub or Vicks Drops or Phillips Milk of Magnesia–none of those ever seem to have come in 8-sided containers. It might have contained some other magnesium salts–that was common enough–or it might have been a poison bottle of some kind, except most poison bottles were triangular, rectangular, or 6-sided, not 8-sided according to what I can find so far. The flat sides continued up the side of the bottle for at least an inch and the sides were all the same length–at least on this half. 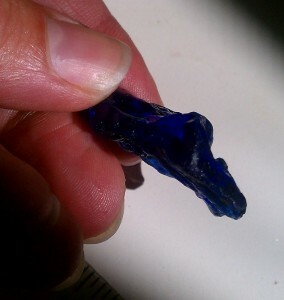 Gorgeous blue glass in the light--all the sides seem to be equal length. At least on this half. So… that’s mysterious bottle #1. 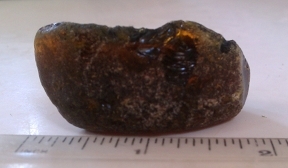 Here’ the inside curve of the bottle. The inside of the brown bottle. Not very large, either. It’s also about 1.5″ long, but it’s only part of an arc. It’s been a long time since geometry class, so I’m not sure how to calculate how much of the arc that is, but I’d be willing to bet this bottle was round, not oval, so I’d make a rough guess that it was about the circumference of a modern standard pint bottle–but it’s very thick-walled and thick bottomed, so maybe a big beer bottle or a medicine bottle. The blue glass is very shattered and pitted and thick. 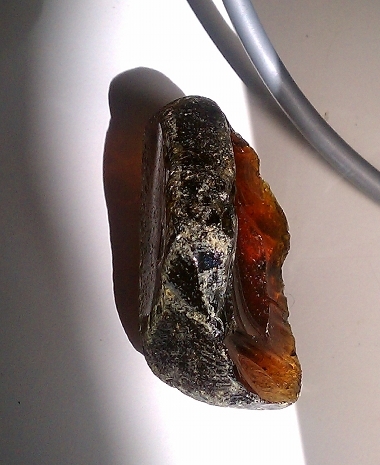 It is probably part of a much larger, very thick piece. 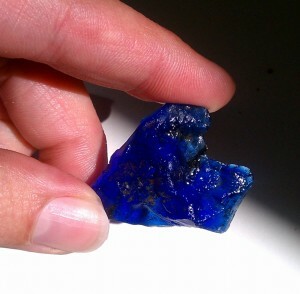 It's very thick also, and the color is dense. The clear is a hefty chunk since my index finger there would easily slip inside the completed bottle neck with room to spare. 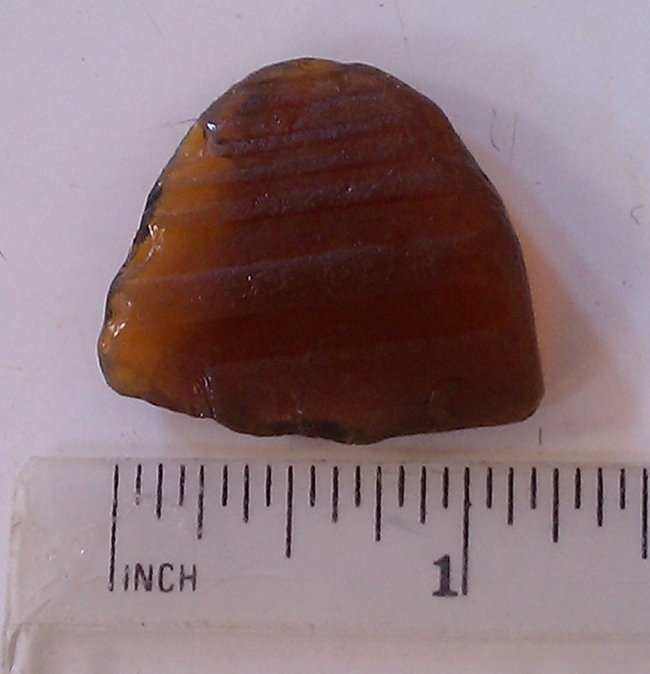 I also found this piece of amber glass that is a compound curve and has the rubbed-down remains of small horizontal ribs. I’d guess it’s from the top of a beer bottle. Sadly, none of the green pieces had any distinguishing marks or unusual shapes, though they did come in two colors: kelly and a slightly darker shade. Alas, they photograph very blandly, so the container photo is as good as it gets. There were also several other pieces of blue glass, but like the green, they had no interesting characteristics aside from being very dark or very light in color. If you like the glass container picture, you can download it as wide screen wallpaper. 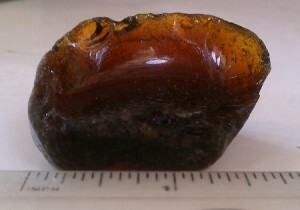 This entry was posted in beach glass, photos. Bookmark the permalink. I’ll have to let it wait until I finish the book. or at least until my finger isn’t taped up. As a beach glass junkie, I am quite impressed with your haul! 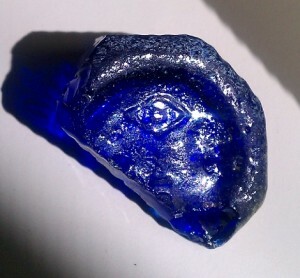 The D in the blue glass image totally looks like Bilbo Baggins from The Hobbit. Curly, round head and all. However, that is a cool bit of glass all around! 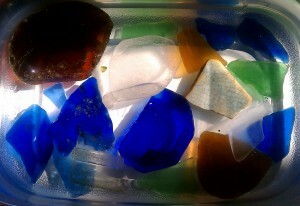 I miss beach glass hunting!! 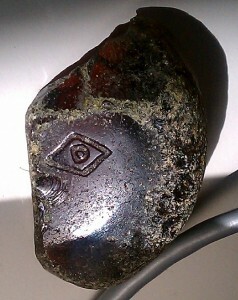 You are so lucky, especially finding the grouping of such intriguing pieces. 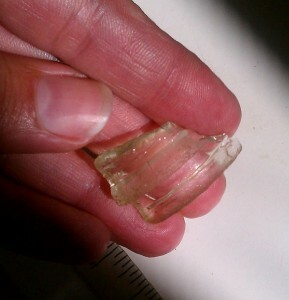 Love your great find — makes me want to go beach glass hunting on this upcoming wonderful-weather September weekend!!! I live at the mouth of the Chesapeake Bay, and I am never so lucky as to find such awesome beach glass! I’m jealous!